Though rarely fatal to the plant, tomato plant diseases are extremely frustrating to gardeners who are anticipating fresh, delicious tomatoes. For many, home-grown tomatoes are the highlight of summer, so getting diseased fruit is a huge disappointment. 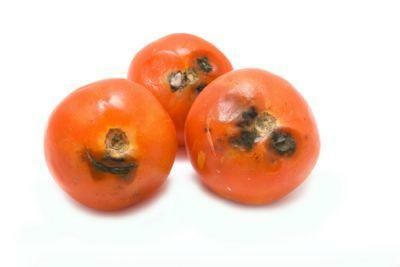 Most tomato diseases are cause by the weather. Damp, cool conditions frequently cause problems for tomatoes because they tend to prefer the hot temperatures of summer in rich, well-drained soils. While there are many diseases that can impact tomato plants, you will find that only a few will be relevant to you. Certain diseases are more prevalent in specific areas. To learn which ones are a problem where you live, check with your county Extension Service. They know which diseases are common for the tomato plants where you live. Armed with this knowledge, you can select varieties that are resistant to those particular diseases. Typically, the Extension Service can tell you which varieties do best in your local. They should always be your first stop when you need information about what will grow where you live. The following chart shows just a few common diseases that afflict tomato plants. It will also tell you how to recognize the disease, what steps can be taken to control it and what parts of the plant are affected by the disease. Use this key when identifying the plant parts affected: G= Green Fruit, R= Ripe Fruit, L= Leaf, S= Stem and Rt= Roots. Because this is only a short list of the numerous tomato plant diseases you may have to deal with, you may want to learn about some that are not listed, or see images to help you identify them. The Tomato Problem Solver for more in-depth information.